Balayage has become the ‘it’ hairstyle for women. 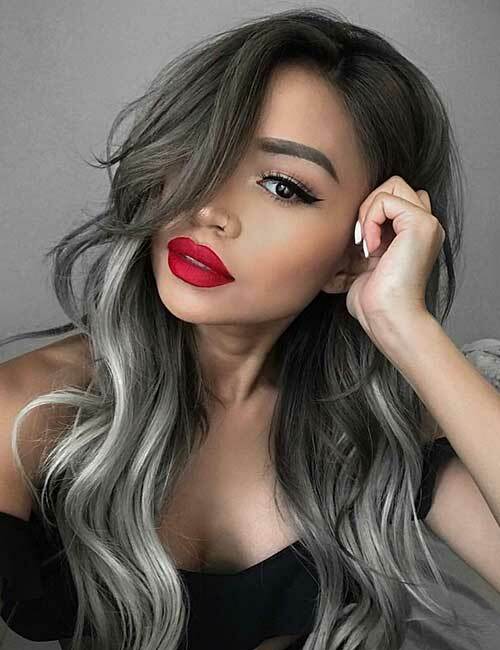 Although the hair coloring technique has been around for a long time, it has become extremely popular of late with celebs from all over the world sporting the look. With a multitude of variations in color to choose from, and the style’s customizable nature, it can be safely said that the trend is here to stay. 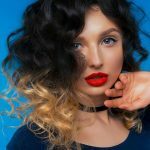 Keep reading to find out why we love balayage so much and browse through these 25 different styling options on balayage for black hair that have swept us off our feet. ‘Balayage’, which means to paint or to sweep, is a French hair coloring technique that incorporates hand-painting your hair without foils or caps. The highlights are not uniform and are strategically placed to create smoothly blended color styles that suit hair of all textures and length. 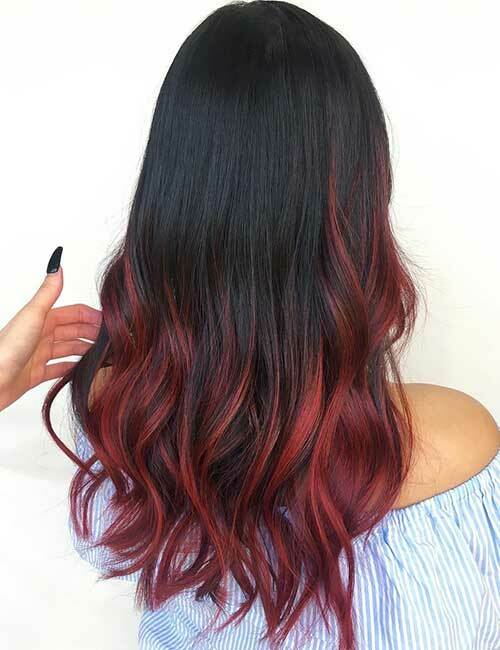 The color is smoothly swept onto your hair to create a myriad of effects – from beautifully sunkissed looks to bold-but-classy unnatural color styles. When done right, the style looks extremely flattering and is super easy to maintain. The best part being, your hair will look just as stunning when it starts to grow out without the need for touch-ups. Put your gloves on and apply the petroleum jelly onto your forehead, ears, neck, and along your hairline to avoid skin staining. Put on a shirt you wouldn’t mind getting stains on and drape an old towel around your shoulders. Following the instructions on the balayage kit, mix the colors. Clip away the crown section of your hair and work with the bottom part of your hair in sections. Using the brush that comes with the kit, start streaking the color from the mid-lengths to the bottom of your hair. Ensure that you are applying more color at the bottom and sparingly streak the higher parts of each section. Keep repeating the process until you’re done with all of your loose hair. Unclip the crown and repeat the coloring process. Once you’re done coloring, run the paddle brush through your hair to spread the color evenly. Leave the color on for the indicated amount of time. Proceed to shampoo and condition your hair. Blow-dry and style your hair to finish the look. Note: If you’ve never colored your hair at home before, consider going to a professional or get an experienced friend to help you out. The gray hair color trend began a couple of years ago and it has only gotten better. 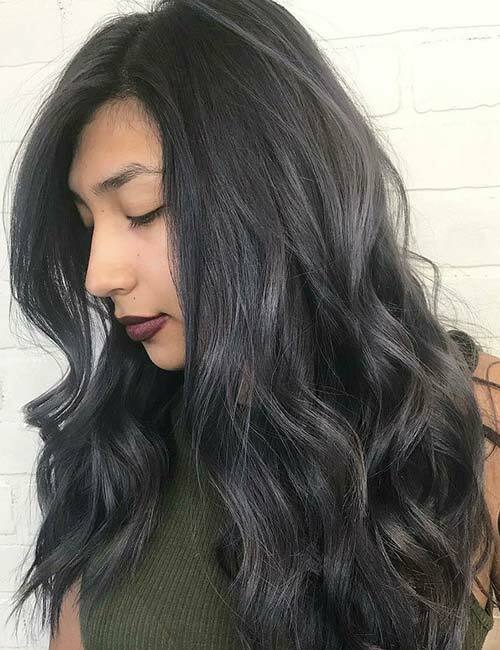 This is one of the smoothest gray balayages that we’ve come across. The transition of colors incorporates shades of black and charcoal that fade out to a beautiful sterling. Ideal for people with cool toned skin, this is definitely one of the coolest (pun intended) styles we’ve come across. This style’s youthful take on granny hair has us head over heals in love! Not completely bereft of warm tones, the dark black is highlighted with customized gray streaks. The transitionary brown tones have been toned and painted with gray. The blend of colors in the style adds dimension and volume, making it ideal for women with thin and fine hair. Speaking of sweeping colors, this style has definitely nailed the concept. The ash blonde balayage on black hair sweeps down so smoothly, leaving us in awe of this masterpiece. 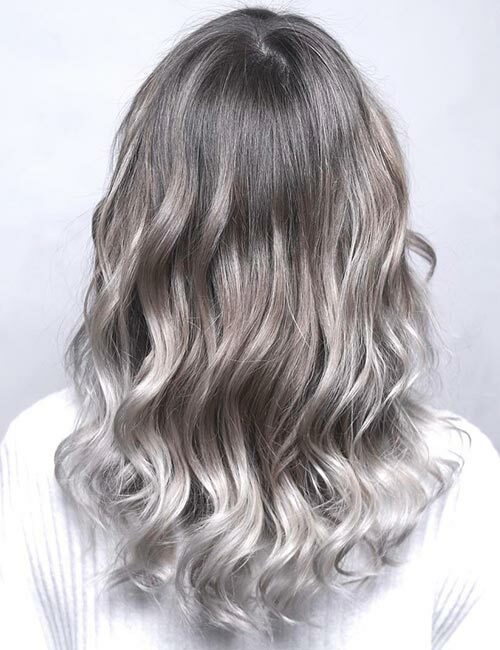 The subtle dirty blonde tones add a ton of character to the gray highlights, both of which have been expertly woven together by the hands of a genius. We can’t wrap our minds around how dirty blonde could end up looking so chic. 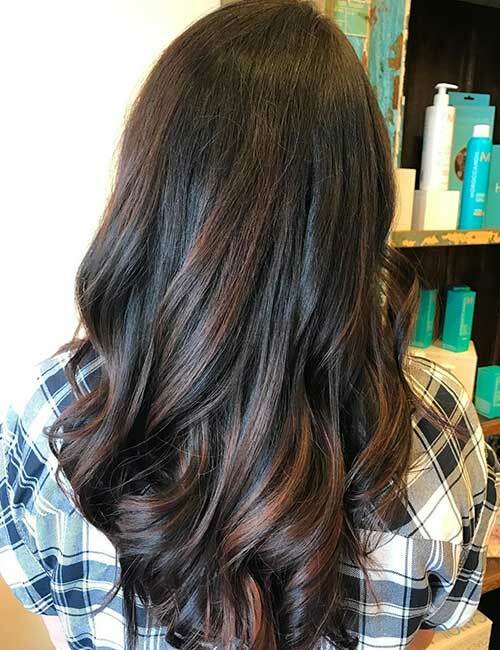 The color which doesn’t usually call out to you has our undivided attention in this balayage style. The strategically placed highlights seem to be grabbing all the light while the darker undertones add dimension to this look. Freshly brewed mocha. That’s what this style reminds us of. The chocolate lowlights are expertly blended with hazelnut highlights. 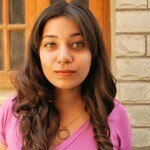 This is the perfect style for women with lustrous black hair. We’re afraid it’ll melt if we stare at it for too long! Who doesn’t like roasted coffee beans? The hues in this style are so caffeinated, it’s starting up a whole new kind of coffee addiction. The natural black blends out smoothly to a brown roast. This style is perfect for fine haired women with medium length hair. There are few things that go better with black hair than this smooth melting chocolate. The chocolate streaks are meticulously and sparingly placed from the mid-lengths of the hair and work down to create a multi-hued dark chocolate fantasy. 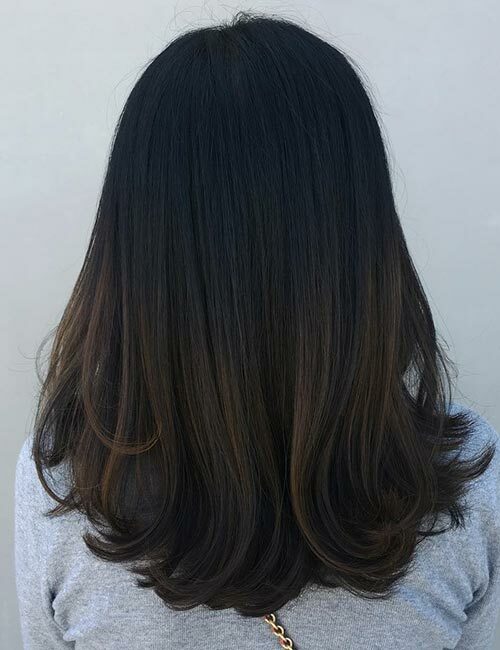 The warm tones in this style make it an amazing balayage style for Indian black hair. 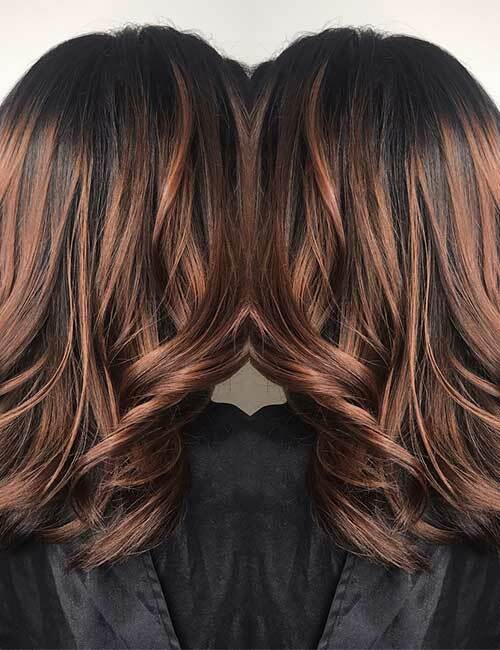 It’s so rare to see a perfect cool-toned brown, but this style has more than nailed it! The streaks start high up on this long bob, creating a root-melt effect. The framing strands have been expertly lightened and toned. 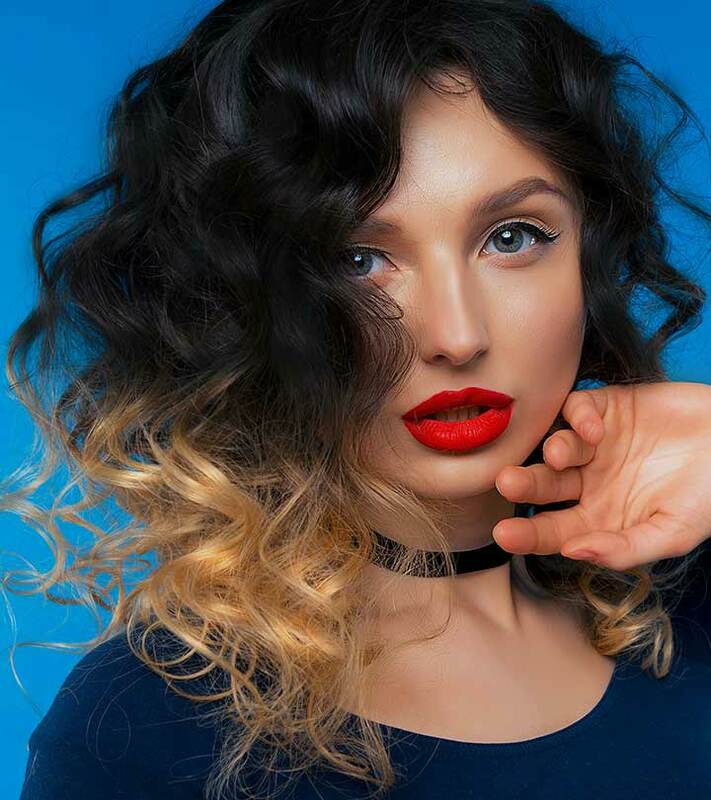 This is definitely the perfect color to spruce up a wavy black lob. Subtlety is an art and this hairstyle is a masterpiece. If you have straight black hair and want to add a little dimension, this style is just what you were looking for. The subtle brown highlights create a natural sun-kissed look for women who like to keep things simple. Although we’re always ooh-ing and aah-ing over cool tones, rose gold never fails to disappoint us with its perfect amount of brassiness. The pink and peach undertones add so much character to this style. The transition from dark natural color to the unnatural highlights is flawless, which is hard to achieve when working with colors that are so far apart on the spectrum. This warm-toned balayage is reeling us in like fishes on a line. The style is generously streaked from very close to the roots. The dark natural hair blended out to a mahogany brown creates a low-light effect that adds dimension to the look. This is another great style for long wavy bobs. These warm tones are killing us (in the best way possible, of course.) 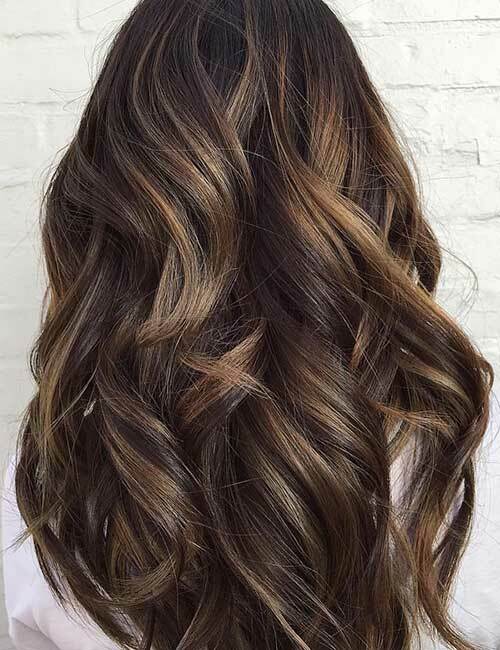 The balayage has concentrated highlights near the face-framing strands and the lower sections of the hair, becoming sparse as you go around the back. The effect is truly mesmerizing, making this an ideal style for fine wavy hair. The balayage artists are nailing these styles with this superior artistry. The framing strands on this style are extremely concentrated, creating the same kind of dimension in the front as it does at the back. The natural black color effortlessly blends out to a wine red, creating a beautifully bold look. Ooh, this deep red. We would kill for hair like this. 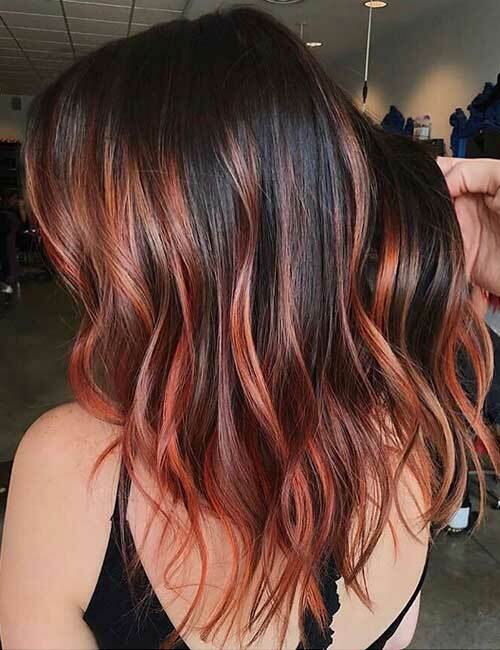 The crimson highlights are woven into the black hair with fiery orange undertones, making this the style for lovers of bold warm hair colors. 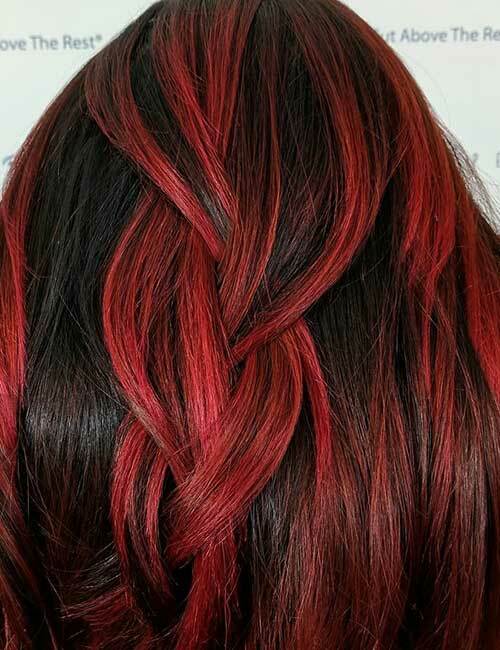 The highlights are generously placed very close to the roots on layered locks to create a flaming masterpiece. Blue is an absolute favorite when we’re talking unnatural colors. The shades of turquoise in this style are beautifully woven to create a hairstyle that looks like a portrait of the ocean. This style is sure to suit all textures and the colors are expertly swept down from extremely close to the roots. The blend of colors is sure to look just as beautiful fading out as it does in this freshly painted picture. This straight A-line bob is what dreams are made of. 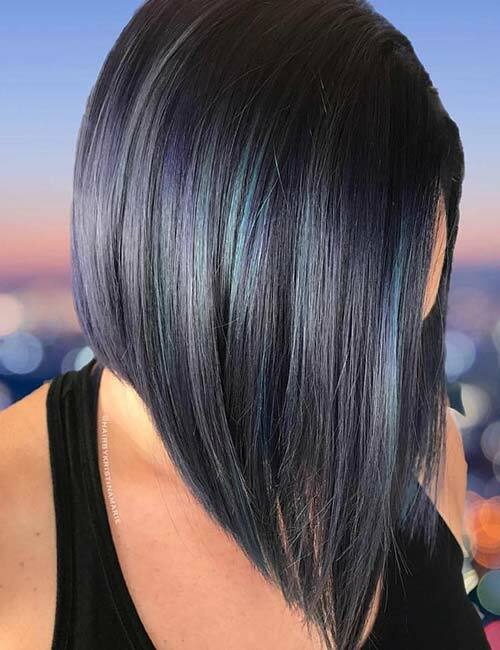 The style incorporates a smooth root-melt that has been blended out to the darkest blue with subtle teal highlights that add dimension. This is the perfect style for fine straight hair to add the appearance of volume. And the fact that it looks totally badass does not hurt one bit. 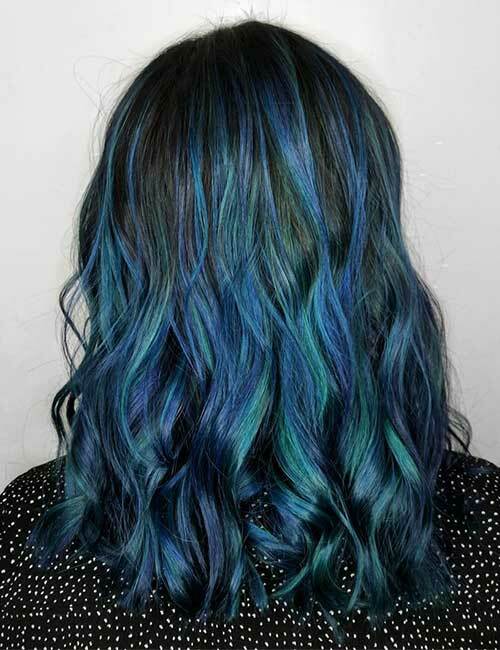 We just can’t get enough of these blue balayage styles. This navy blue with teal undertones couldn’t be any more perfect. 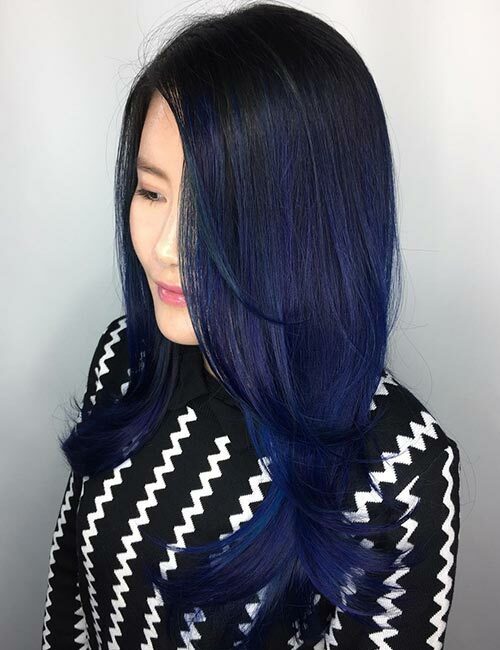 This is the perfect style for women who want a bold blue without straying too far from their natural hair color. The black effortlessly blends into the dark blue that further transitions to a lighter shade – putting its wonderful undertones on display. This style is so subtle, yet so bold. If you love your black hair but are dying to let out your inner mermaid in the subtlest way possible, this is the style for you. 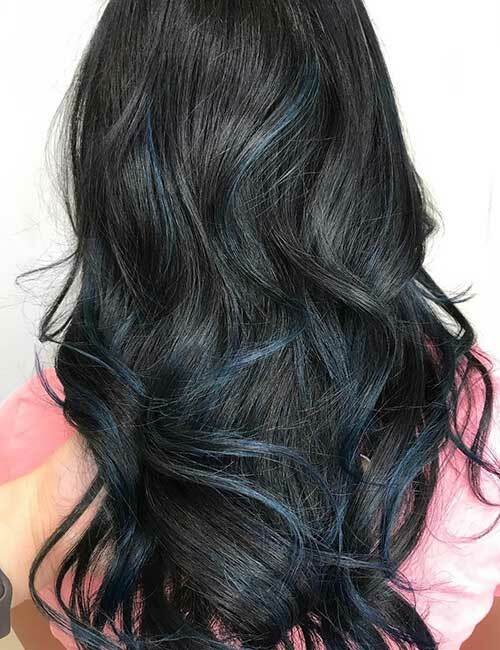 The blue highlights are judiciously placed around the mid-lengths and tips to create this beautiful style. If you love unnatural colors but can’t go all the way because of work or college, this style is meant for you. This style is tealing our hearts away. 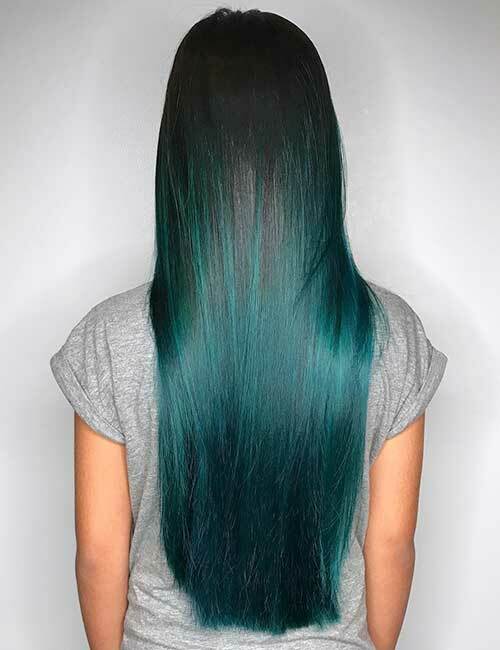 The straight black hair is so gorgeously blended out to a stunning teal. We seriously cannot get over how great this style is. If you have long straight hair and itchy fingers, this is everything your hair needs and more. We do not have enough green balayage styles out there. But can any amount really be enough? Pass the tissues because we’re literally crying over how great this emerald balayage bob looks. 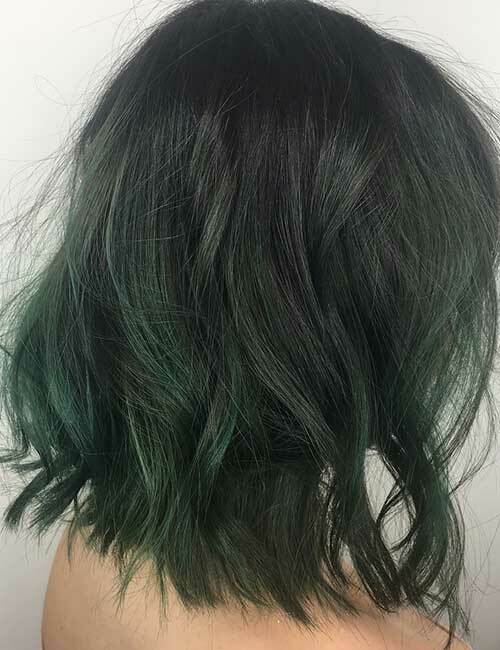 Green is a totally underrated color and this goth-inspired hair painting is doing the color complete and utter justice. 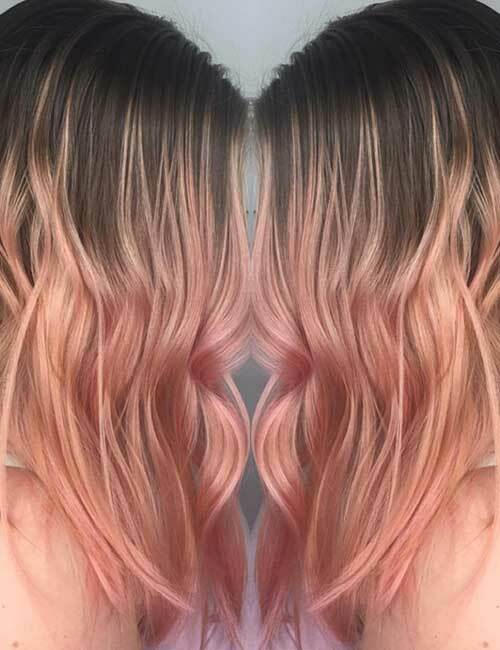 This pastel pink has been meticulously streaked through the black hair to create a beautiful ombre balayage. The pastel pink has rose gold and sterling undertones, which create dimension and give a metal finish. This hairstyle is sure to suit all hair types and textures. 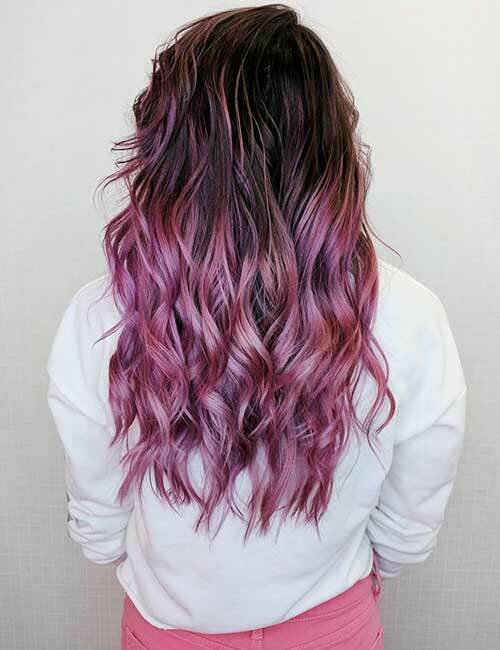 Lavender is probably one of the biggest trends in pastel hair colors. This look incorporates brassy undertones which add a little bit of warmth to the look, giving it a lavender gold finish. The color transitions from black to a brassy lavender to a light sterling lavender. This style is sure to look stunning on all hair types and textures. 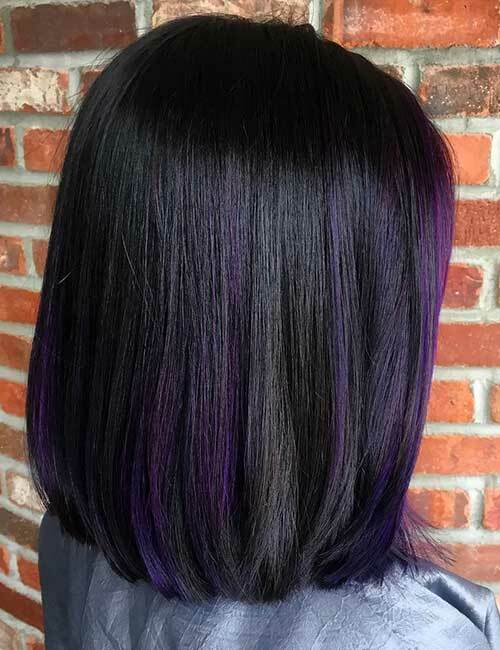 This eggplant purple looks amazing on black hair. 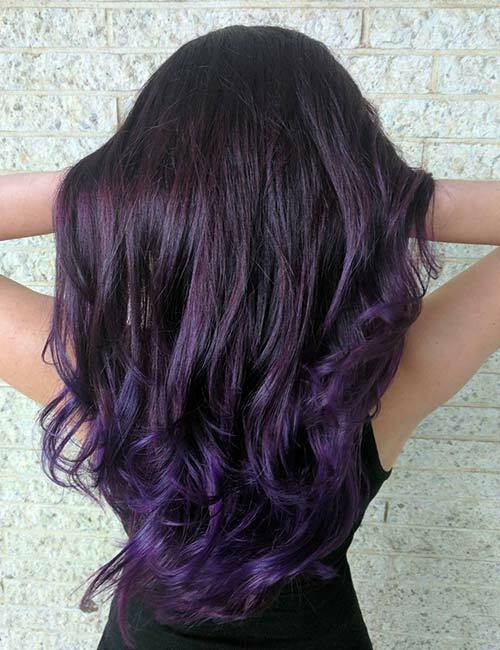 The dark roots effortlessly blend out to a deep purple that is so strong at the tips. The textureless blending gives the look a smooth finish, making this style perfect for voluminous and textured hair. For an unnatural color, the purple in this style sits so naturally with the black. This style incorporates customized highlights that subtly blend into the black hair. The purple hair frames the face and is sparingly placed around the long bob. The look is ideal for women with thick black hair. How Long Does It Take To Do A Balayage For Black Hair? 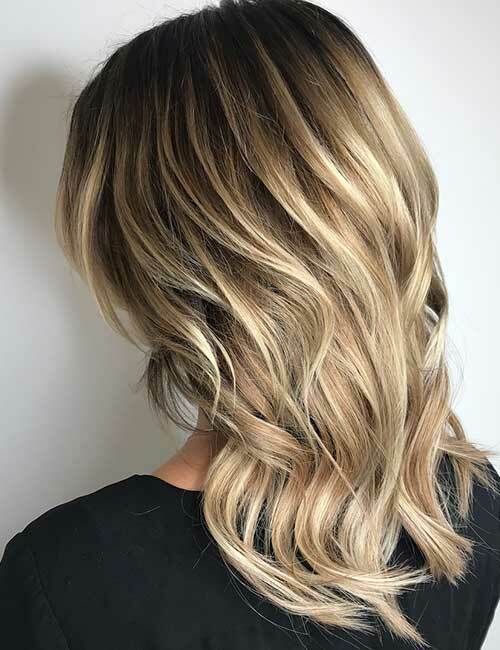 Depending on the color you’ve chosen for your hair, it can take from one 30 minute session to multiple 45-minute sessions to achieve the balayage look. 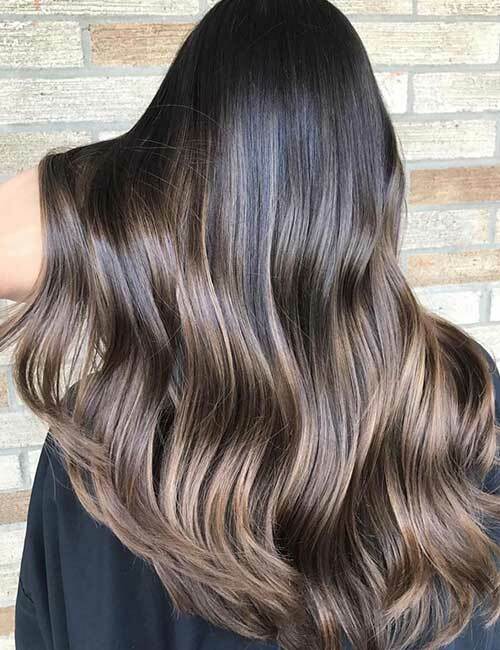 A dark brown balayage can be achieved within 20-30 minutes whereas a major transition from black platinum or baby blonde can take multiple 30-45 minute sessions. A natural balayage that is fading from black to a brown or blonde does not take a lot of upkeep. For a really light blonde, you could use a purple or blue shampoo to keep the color fresh and toned. Apart from this, you can simply let your hair grow and get regular trims until you are left with subtle sun-kissed tips. 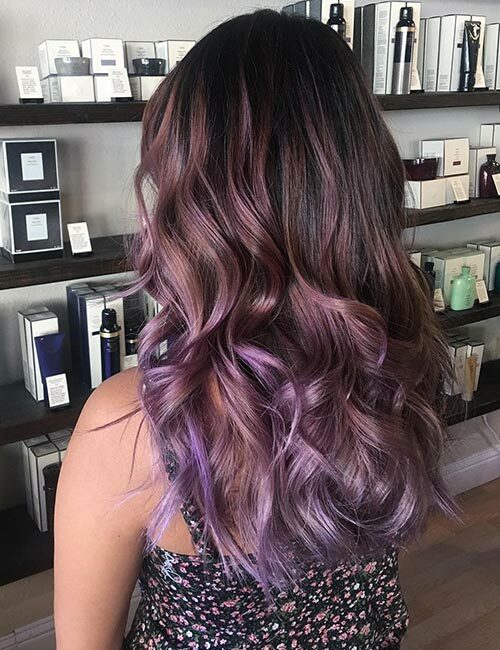 For an unnatural balayage with bold or pastel colors such as blue or purple, using a blue or purple shampoo every now and then becomes crucial to keep out brassy tones. You will also have to use a color protecting shampoo and conditioner to keep the color from fading out too quickly. It’s best to choose products that do not contain silicones or sulfates. Ensure that you use heat protection while styling and regularly pamper your hair with hair masks and bond building treatments such as Olaplex. 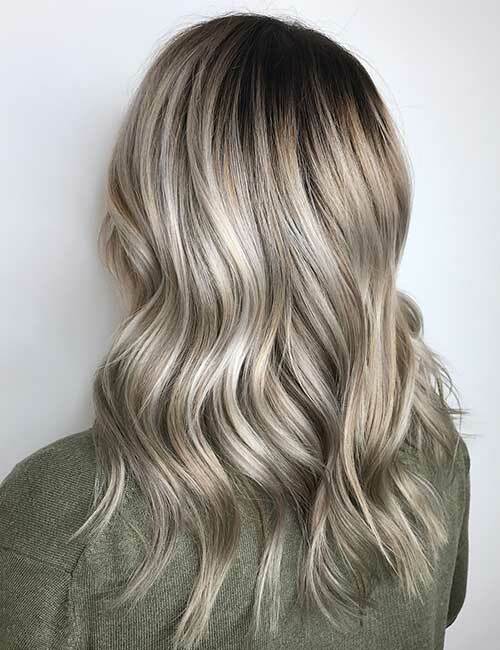 Whether you want to spruce things up with a few subtle highlights or go all the way and get a gorgeous pastel melt, with a balayage there is something for everyone. 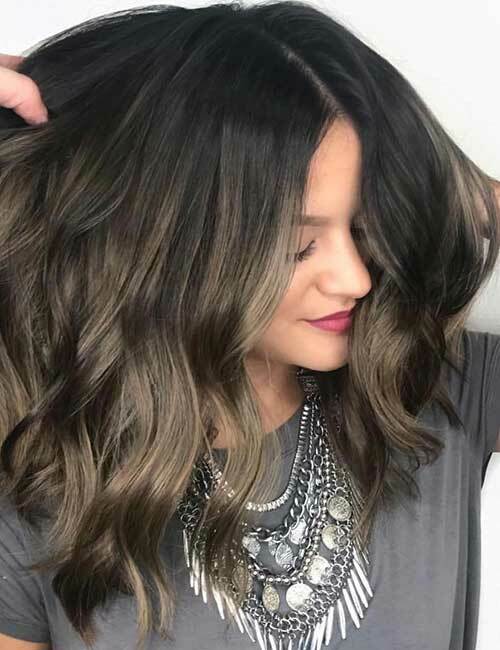 Do you love balayage as much as we do? Or do you prefer regular highlights? Tell us what you think and what you have in store for your hair in the comments section below.